Life on the ocean wave is more than a metaphor this summer. On the newest luxury cruise ship in the ocean, the wave is in your bedroom. On board the Norwegian Epic the wave IS your bedroom. The walls of the stateroom curve and waft all the way to the balcony. Norwegian Cruise Line’s wave thing in the rooms of its sleek and stylish ship have sparked off a great debate since the ship launched in May. Much of the debate has been about the toilet on one side of the wave, and the shower on the other side. There is a screen, but the plumbing and the furnishings are all part of the same symphony. Some love it, others are not so sure. It is unique and contemporary and chic, a very open curved room different lighting from what we have seen before. Too open? The debate rages on. The walls are curved. The couch is curved. The shower on one side and the toilet on the other are fitted to blend in with the curve. The bed isn’t curved, but you look back to the door and you know this is somewhere special, iconic and iconoclastic at the same time. And that is before you open the balcony, hear the seductive slush of the waves, and have thrown in your sandman-filtered eyes the sea vista that is the indescribable deal-maker for a cruise holiday. The ship picked a great name for the year that is in it, when “epic” has replaced ‘random” as the first fit in every teenage vocabulary. The Norwegian Epic is as epic as you can fit into 153,000 tonnes. Epic is beautiful, sleek and innovative and very different from the eleven other cruise ships that are launching this year. When we pulled out to sea there is a rising sense of excitement, 2,500 travel agents tucking into the free drink on a dozen bars, and a lot of ship to explore in a short period. 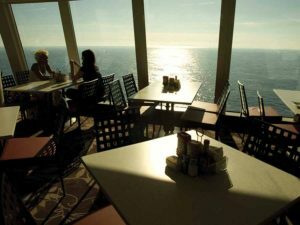 Most of the energy in modern cruise ships goes into dining options – there are 21 restaurants of which 11 are covered by the all-in cruise price. The others come with small mark-ups, twenty or thirty dollars for a $100 meal. The restaurants check-list all the main world cuisine and fusion options, headlined by two great Japanese joints and a Brazilian Churrascaria steakhouse, but also the novelty of onboard pizza delivery. 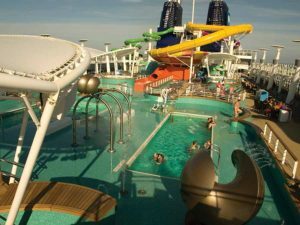 One of the difficulties of cruise ship design is that there is not much you can do with a deck, a few pools, a climbing wall, a flow rider. The Epic put in a water slide. This is an epic water slide, that wraps itself around the funnel. It isn’t pretty, and no doubt the stateroom design team are shredding their coiffures at the sight of it. Such is life at sea. Good news for singles. The future is solo, says the sales manager of Norwegian Line, Andy Stewart. Hence the rooms on decks 11 or 12 are called studios. Solo travellers over 30 are a large group in the USA and a growing one in Europe. So Epic has put in 128 staterooms for solo travellers, no single supplement, no attempts to mug and gouge the person who chooses to travel alone. Norwegian also pioneered the ship within a ship. Their luxury cruise clients, Courtyard guests, are on the same ship as the rest of us. They use separate elevators, private dining options and tend to stay clear of the buffet brigade, but they have more entertainment options. Big hit entertainment options have helped propel the ship into the maritime imagination this summer. For the first time at sea, Blue Man Group is on a cruise ship, there are new shows like Cirque Dreams and Dinner in the Spiegel Tent, celebrity impersonators from Legends in Concert and family entertainment with Nickelodeon at Sea, with children’s characters stopping by the tables at breakfast. The idea is to allow the high end clients access to these and other facilities, the tapestry of smaller entertainment venues that opens up through the decks. A Silverseas or Azamara on the upper floors of your ship. It is all very impressive, the NCL CEO Kevin Sheehan describes it as “sizzle on the steak.” A third generation Corkman, he has the onboard New York style pub named in his honour, Irish flavour with baseball pictures on the walls. The final piece of sizzle from Epic is technological, the facial recognition system which will allow passengers to select pictures of themselves electronically, without having to spend long periods scanning thousands of shots on big boards. You just have to look at a dozen or so people who look like you. Must get those wave designers working on the job.